Animals decide and act based on past and current sensory information. 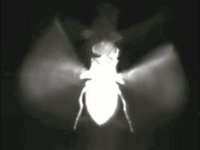 The major goal of our lab is to computationally and mechanistically understand how neural processing of external input guides behavior and how this processing is modulated depending on the environmental and behavioral contexts. To achieve this goal, we are using the fruit fly Drosophila melanogaster, which has been increasingly recognized as one of the ideal organisms for investigating the neural circuit basis of behavior. 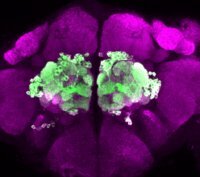 Due to the relatively small number of central neurons, many neurons in the fly brain are identifiable and accessible. We can monitor the responses of these neurons to sensory stimuli by in vivo electrophysiology and imaging. Various genetic tools are available for not only labeling but also manipulating neurons. On the other hand, technologies have been developed to monitor individual flies behaving in a virtual environment where external stimuli can be precisely controlled online. 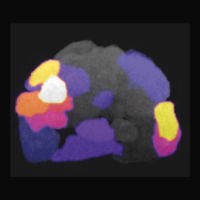 With these data in hand, we will utilize quantitative modeling approaches to better understand the computation and the neural mechanisms underlying behavior at cellular, synaptic and circuit levels.